Perhaps one of the games historically most strongly associated with the idea of talking about and critically analysing games, Braid was the subject of the first Critical Compilation here, written by Travis Megill back in 2009, as well as a panel podcast in 2012 – both of which still serve as good introductions to the sprawling topics of Braid and the processes of critiquing it. The arguments surrounding Braid in the context of its release seem very much of their time, and it’s interesting to look back on them a decade later and think about where game criticism is at now. To go back and read the critical discussions and forum posts that Braid sparked back in 2008 is to be transported into an uncanny alternate dimension, where arguments fixate on the (almost incidental) formal abstraction about the nature of games and art and what makes one good or successful, or whether form can be successfully tied to narrative in games, or whether knowledge of authorial intent can or should influence a player’s understanding, all the while being cohabited by impossibly civil, thoughtful and insightful comment threads. Unsurprisingly, people haven’t stopped writing about Braid in the intervening years, and we’ve since had a lot of quality and enlightening work on many facets of Braid’s design, meaning and meta-industry relationship. More recently, a few writers have also re-examined the depiction of the relationship at the centre of Braid’s narrative, particularly considering Jonathon Blow’s occasional public resistance to feminist readings both with regards to his games, and in culture more generally. With August 2018 marking the tenth anniversary of Braid’s release to Xbox Live Arcade, the time seems right to build upon and reframe the original compilation, while highlighting some of the critical work that’s been done by writers, bloggers, vloggers, academics and students in the years since. “It is about relationships, yes, but I can’t tell you exactly how. It is damnably vague, in the same way that student art films are vague – all sound, no real fury. A decade out from release, it feels undeniable that Jonathan Blow’s puzzle-platformer changed the gaming landscape in ways big and small, but the actual substance of the game – whatever that is – seems distant, tied to a moment past. That Braid was “important” was an incantation of reviewers at the time, who generally for the most part heaped praise upon the game. It’s also an adjective that frequently caveats criticisms by early naysayers, whom we’ll get to later. “It’s easy to overstate the influence that Braid had on indie gaming. To some in the industry, it’s just one game (albeit it a memorable one) among many that happened to flourish in the indie boom of the late 2000s, which is itself tied closely to improvements in distribution through platforms like Steam. This process also received some focus in the film Indie Game: The Movie (2012), which featured Braid and interviews with Blow, and looked at the game’s breakout success as well as some of the pitfalls this success brought for its creator. Braid also preceded a lot of Braid-like games. It would certainly be incorrect to say that Braid invented the puzzle-platformer, but you’d guess it’s at least partially responsible for the proliferation of them that followed. Braid, along with other games of the time such as Passage, was repeatedly seen as a harbinger of the idea that games can be art. Arguments about this seem tedious and antiquated now, but there you go. Roger Ebert, famously, did not think Braid (or any other game for that matter) was art, but then, people disagreed with Roger Ebert. Anecdotally, and perhaps unsurprisingly, Braid also now seems to be a text in many college and university English courses, judging by the number of blogs I’ve stumbled upon that have doubled as class assignments. This is coupled with a number of academic papers in various fields that have focussed on Braid, which shows at the very least that it’s a game that people have been willing to do a lot of thinking about. Some of the best (favourable) writing on Braid comes from authors investigating just one aspect of Braid’s design. William of Me & My Puzzles made a short video celebrating Braid’s minimalist puzzle design, which always clearly shows the player what the problem is and what tools they have to work out a solution. Mark Brown of Game Maker’s Toolkit distilled Jonathan Blow’s 2011 GDC presentation about Braid’s rewind mechanic into an eight minute video demonstrating how exploring implemented rules lead to the puzzles in Blow’s design philosophy. Sam Hughes of qntm explored the mechanical notions of time travel and time distortion as represented in Braid, and pondered how the shifting rules of each game world could be applied to science-fiction narratives. 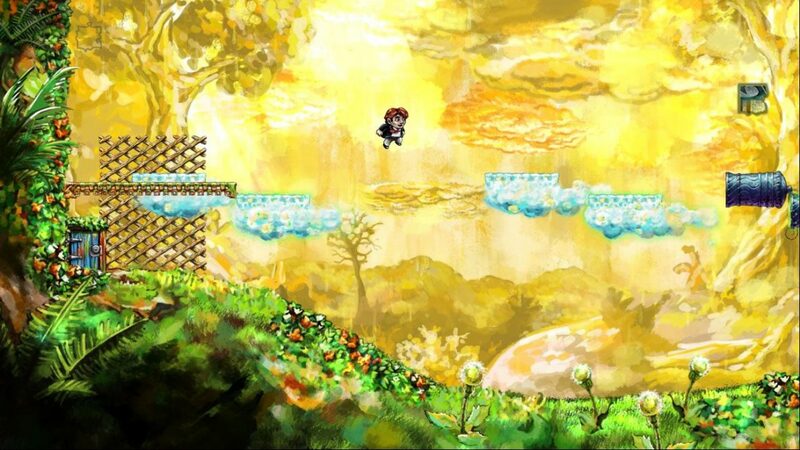 Also in 2012, sound designer Chris Olson was fascinated by Braid’s use of digital silence, and suggested how its circumstantial appearance in the game might help support certain interpretations of the narrative. Meanwhile at Rock Paper Shotgun, Julian Benson had a go at experimentally transcribing one of Braid’s levels into musical notation. In 2015, Hellman appeared in a short retrospective interview with Marty Silva at IGN to talk about choices that went into Braid‘s artwork. Much of the early criticism levelled at Braid focussed on the game’s accessibility problems. This manifested in the game’s mechanics, the perceived difficulty of the puzzles, and in attempts to make sense of its narrative. Often, one problem fed into the other. Soon after the game’s release, Michael Abbott of Brainy Gamer hosted a public correspondence with Iroquois Pliskin of VersusCluCluLand. While Iroquois thought Braid was “a game design masterpiece”, Michael disagreed, saying the puzzles represented too much of a challenge to allow a connection between narrative and gameplay, while finding the writing in the text fragments “awkward and mawkish”. Spencer Greenwood at Noble Carrots thought that if Braid was indeed emblematic of Blow’s thesis about how games should be designed, its reliance on tightly authored experiences misses important aspects of play, such as allowing players to explore and innovate in ways that are tangential to the game’s purpose. Also in 2008, Dan Golding at Subject Navigator called Braid “the best worst game of the year” likening it to 1959 French new-wave film Hiroshima Mon Amour, and saying that while he appreciated what both texts were trying to do, and that he was happy for them to exist in the world, he found the difficult process of engaging with them excruciating. In early 2009, Kristian Majewski from Game Design Reviews agreed that Braid is too hard, but “hard in a SPECIAL way that doesn’t quite match the reason why it was supposed to be hard in the first place.” He went on to examine specific puzzles which betray the player and break with the game’s apparent intent. Julian Murdoch from Gamers With Jobs argued that the problem isn’t just that Braid is too difficult mechanically, but that it puts barriers to understanding in all directions. He goes on to show how this is repeated with Braid’s text, particularly in its ending, contrasting it to Mark Danielewski’s perplexing novel House of Leaves. Murdoch notes Braid is difficult to parse, like House of Leaves, but unlike House of Leaves the meaning of Braid is dominated by the author’s (intervening) voice, which makes trying to find meaning in it frustrating and unsatisfying. Emily Short, while reflecting on a chapter about Braid in Tom Bissel’s book Extra Lives, wrote in 2010 that she thought the quality of the actual writing quality of Braid’s text sections was inexcusable, and betrayed the author’s rigid-minded presumptions about how text and mechanics can work together. Finally, in 2011 Matthew Lee at Beefjack wrote about “why Braid really is pretentious“, which for better or worse is a term that has been thrown about a lot with regards to Braid. Truthfully though, assumptions about Blow’s intentions for Braid were mixed up into people’s interpretations of it even before it was released. In the lead up to Braid‘s release, Blow gave some well-received lectures about game design in various places, so some critics presumed Braid itself was an extension of this manifesto. Tom Armitage of Infovore took issue with Blow’s interventions into comment threads as well as a number of the things he said in the AV Club interview, citing Barthes’ “death of the author” principle to explain that players should not need to know authorial intent in order to derive meaning from a game. Blow eventually backed out of arguing about his game directly, apologising in a comment on Julian Murdoch’s piece at Gamers With Jobs. Despite this he’s occasionally continued to be drawn into discussing the meaning of Braid in interviews. In any case, Blow’s interventions into how Braid is interpreted have affected readings of the game in the years since, with writers clearly mindful of (and sometimes directly accounting for) what Blow has said are correct or incorrect ways to look at the game. At other times writers have been weary of problematic positions he has taken on topics separate to, but not unrelated from, his game. Journalists have, in interviews, generally played off the idea of Blow as an outspoken but clever creator, particularly as he went to make his next game, The Witness. A 2016 New Yorker interview called him “a prickly genius“, while in an interview with the Guardian in the same year he notoriously claimed “he wanted to make games for people who like to read Gravity’s Rainbow“. Bill Coberly responded to this frequent characterisation with a 2016 piece at The Ontological Geek, arguing that no matter how good Blow’s games are, holding on to the idea of a genius is destructive, unnecessary, and won’t do us or him any favours. Inevitably Braid, with its foggy relationship themes, inter-textual referencing, fragmented narrative text, shifting puzzle mechanics, twist endings and inconclusive epilogue, lead to a lot of speculation from forum-posters and critics alike about what it all meant. Michael Clarkson saw the game as an attempt to reconcile form with narrative, art with science, saying the game’s ambiguities revealed to the player the necessity of taking all angles into account. Iroquois Pliskin looked at the mechanics and underlying structure of the game to see Braid as communicating the alienation and violence that comes with mastery and manipulation. Evan at Thinking While Playing proposed a meta-fictive reading of Braid, which he saw as using an interior world of recognisable gaming conventions to help us think about the possibility of the future of games. A popular interpretation which proliferated early on in forums, is that Braid tells the story of a nuclear scientist who regrets creating the atomic bomb. Matthew Bentley at Gamasutra put together a fun and convincing (if not hole-proof) case for this in 2012. Patrick Jagoda at the University of Chicago takes the reading one step further to argue that Braid makes players aware that they are complicit in historical systems of violence, in Fabulously Procedural: Braid, Historical Processing, and the Videogame Sensorium, published in journal American Literature in 2013. Youtuber JustNukeIt made an analysis video in 2014 which suggested Braid was trying to reconcile the philosophical and scientific search for truths with the futility of mistakes. Meanwhile, in 2015 Franscesca Borg Taylor-East from the University of Malta Student Philosophical Society read Braid as a partial analogy of the myth of Sisyphus, arguing that we come to feel sympathy for Tim because of the circular futility of his task, despite his obvious wrong-doings. At Popmatters in early 2009, L.B. Jefferies came to the defence of Braid’s sometimes-maligned text fragments, arguing they are only misunderstood because they are deliberately experienced out of order. Similarly, in 2016 Ted Lee argued that a definitive, cohesive narrative could be built by reading all of Braid’s text backwards. The author of Problem Machine in 2012 suggested that our continual hunt for metaphorical and/or ‘correct’ readings is a corruption of the comprehension process, agreeing with Blow’s comments that the game is bigger than something that can be easily described, and that readers’ insistence on ascribing definitive meanings to texts was destructive, elitist and a learned behaviour. One of the earliest readings of Braid came from Holly at Feministe in 2008, who focussed on the nature of the relationship between Tim/the protagonist and the princess, looking at the ways the game brought potentially controlling behaviour to light while also making it ambiguous. In 2013, Leda Clarke made a close examination of the contents of the Princess’ room of world 1, theorising that the objects found there suggest Braid depicts its protagonist as living the search for his ex-partner as kind of a psychosis. Some writers have expressed unease at the way Braid depicted the relationship of Tim and the Princess. On the one hand, it was subverting a gendered videogame trope by revealing Tim to be the monster, rather than the hero, of the story. On the other hand the possible metaphorical use of this depiction is concerning, as is the implied resolution/redemption for the hero offered by the epilogue. As ever with Braid, ambiguities keep it at arms length. In 2015 Liz Ryerson at Offworld dwelt on how she fell out of love with Braid over time, as its troubling themes became more apparent to her, eventually leading her to create a game, Problem Attic, as a sort of response. Ian Bryce Jones (while writing a piece largely about Problem Attic) in 2017 reiterates how the confluence of Blow’s “clearly-telegraphed hostility towards feminist analysis” with the “privileged position for himself as the sole arbitrator of Braid‘s “true” meaning” might create problems for players. Braid is an interesting and arguably landmark canonical piece of contained interactive software yes, but also an elusive shapeshifter, Braid grows and shrinks depending on your angle. You might feel differently about it depending on which avenues of it and its meta-game you feel need to be considered, how much you want to read on the internet, and whether its creator’s opinion needs to be taken into account. The best thing I can think to leave you with in the circumstances is this: a 2014 computer-science paper by Linus Hamilton titled Braid Is Undecidable. No, I don’t understand it either. If you enjoyed this 10th-anniversary Critical Compilation, be sure to check out our first-ever Critical Compilation, from way back in 2009!